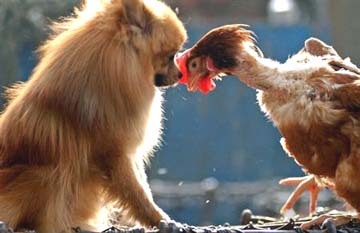 Mammal and poultry closeness such as this dog and rooster are common in Asia and Africa where the deadly H5N1 virus has infected poultry, pigs and other animals. Now a family of eight in Sumatra, Indonesia, have all contracted the lethal bird flu and five have died. Such a cluster is being studied for any evidence of human-to-human transmission that could lead to a worldwide pandemic. Image © 2006 by Reuters. May 15, 2006 Tanah Karo, Sumatra, Indonesia – Five people in an Indonesian family have all died of bird flu, according to Nyoman Kandun, who heads the Indonesian Healthy Ministry’s Office of Communicable Disease Control. Three others in the family also contracted the deadly H5N1 virus, but so far have survived. Eight people in one family becoming infected with bird flu is known as a “cluster” case. Those cluster cases are what medical authorities around the world want to study most closely to see if there is any evidence of direct human-to-human transmission. To date, human cases of H5N1 have been linked to close contact with farm birds such as chickens and ducks. As of May 12, 2006, the World Health Organization (W.H.O.) 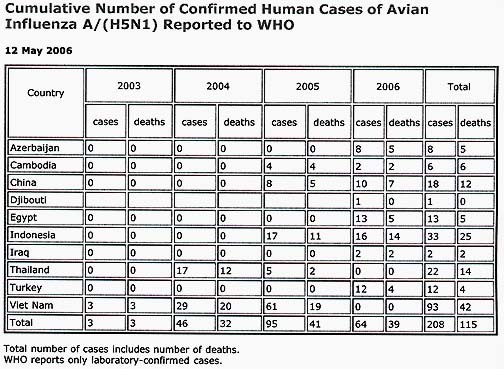 shows cumulative H5N1 cases in Indonesia to be 33 with 25 deaths. The current world total of cases in ten countries compiled by W.H.O. is 208 cases and 115 deaths. 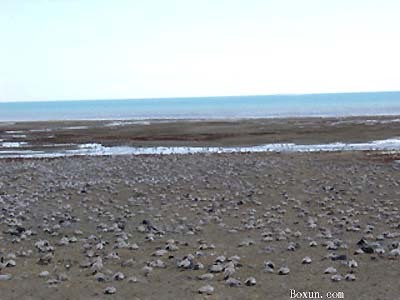 A year ago, when more than 8,000 migratory birds died on Naio (Bird) Island in Qinghai Lake, China, from the H5N1 bird flu virus, the World Health Organization said the die off was “unprecedented.” Medical authorities over the beginning months of 2006 have been alarmed at the rapid rate with which H5N1 has spread to more and more countries. The fear was that the spring 2006 migration of birds into Africa and North America would accelerate the spread of the deadly disease and increase the possibility that the lethal virus could keep mutating into one that can spread human-to-human. 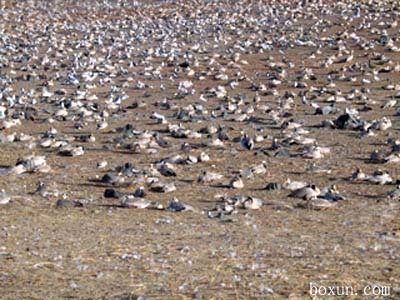 Above and below: In May 2005, thousands of migratory birds such as bar headed geese died on Naio (Bird) Island in Qinghai Lake, China. Images © 2005 by Boxun.com. The New York Times has reported recently: “Defying the dire predictions of health officials, the flocks of migratory birds that flew south to Africa last fall, then back over Europe in recent weeks, did not carry the deadly bird flu virus or spread it during their annual journey. …In thousands of samples collected in Africa this winter, the bird flu virus, A(H5N1), was not detected in a single wild bird, health officials and scientists said. In Europe, only a few cases have been detected in wild birds since 1 April 206, at the height of the migration north. …The flu was found in one grebe in Denmark on 28 April 2006 – the last case discovered – and a falcon in Germany and a few swans in France, said the World Organization for Animal Health, based in Paris.” European agriculture officials have started lifting restrictions to keep poultry indoors.